Why is the alternative cancer therapy market not finding out about the clinical studies that really matter now. It seems like the drugs “in process” get the press. If I had cancer I would not be interested in help later. Maybe some of the words are too big… Like “immune” or “Carica Papaya” (papaya leaf), or “Aqueous”. I don’t think so. I think we are waiting for a pill. The alternative therapy is a nice thought, cool to talk about, but we are needing and dependent on a drug. I am a business person. I am determined to at least get this working thing… this papaya leaf tea…from this four-year-old study on the market. Meanwhile we put it on the market. The market comes back with a statement, not a question. 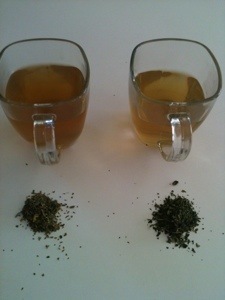 The statement is that there are no clinical studies that show the tea has effect against cancer. Hmmm. I guess because it’s not a pill. Sometimes you just need to DO it. It may be just as important to GET a product that has effect on cancer to market as to research it. In the case of papaya leaf tea, toxicity studies have shown it to be safe, the fda gives it GRAS status, yet wholesalers are constantly backordered and too many people with cancer have never heard of it. The Julia Ruffin Project grows and researches papaya leaf tea and its effect against cancer. Time to go forward. On Indiegogo, which is a way for people to participate in our project (or simply learn about it!). Come see us and let’s just Do it. 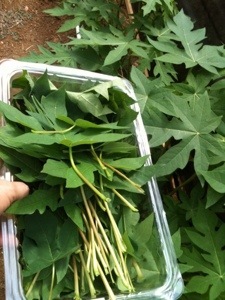 After the first stages of my research on papaya leaf tea I contacted an oncologist to review my study with. I asked him why the papain pills on the shelf all over the world are not just as good a choice as the papaya leaf tea. He told me that earlier in their research with one if the large cancer foundations his team was isolating b12. He said that they put so much b12 in a man that it almost killed him. From this experience he said that he learned how God or nature works naturally we can’t always find scientific reasoning behind. This didn’t stop me from trying to pursue the answer to why the leaf tea is different from papain plain. So far the reason is the co-enzymes that work with, in conjunction with papain.